Nasal Allergy is one of the most common allergy found today. Pollution and environmental changes are one of the most common triggers for the nasal allergy. There are several types of nasal allergy found. At Aashwas Chest & Allergy clinic we have a dedicated team of Allergist and ENT specialists who can handle all type of Nasal Allergy. Allergic rhinitis, also known as hay fever, is a type of inflammation inside the nose which occurs when the immune system overreacts to allergens within the air. 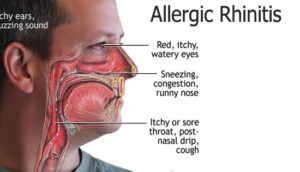 Allergic Rhinitis is one of the most common nasal allergy. Symptoms consist of a runny or stuffy nose, sneezing, red, itchy, and watery eyes, and swelling across the eyes. The fluid from the nostril is normally clear. Symptom onset is often within minutes following exposure and they can affect sleep, the ability to work, and the ability to pay attention at Work. those whose symptoms are due to pollen typically develop symptoms at some point of specific times of the year. Many people with allergic rhinitis additionally have asthma, allergic conjunctivitis, or atopic dermatitis.Allergic rhinitis is usually brought on via environmental allergens which includes pollen, pet hair, dust, or mold. Inherited genetics and environmental exposures contribute to the development of allergies. growing up on a farm and having multiple siblings decreases the risk. The underlying mechanism includes IgE antibodies attaching to the allergen and causing the discharge of inflammatory chemical compounds such as histamine from mast cells. prognosis is normally based on medical records in combination with a skin prick test or blood tests for allergen-specific IgE antibodies. these tests, however, are sometimes falsely positive. The symptoms of allergic reactions resemble those of the common cold; but, they regularly last for more than weeks and typically do not include a fever. you could use decongestants over a short duration, typically no longer than three days, to relieve a stuffy nose and sinus pressure. using them for an extended time can cause a rebound effect, which means after you stop your symptoms will actually get worse. Eye drops and nasal sprays can help relieve itchiness and other allergic reaction-related signs for a quick time. however, depending at the product, you may need to avoid long-term use. Like decongestants, overusing certain eye drops and nose drops can also cause a rebound effect. Corticosteroids can assist with inflammation and immune responses. these do not cause a rebound effect. Steroid nasal sprays are typically encouraged as a long-term, useful way to control allergy symptoms. they’re available both over the counter and by prescription. our physician may additionally suggest immunotherapy, or allergy shots, if you have intense allergic reactions. you can use this treatment plan together with medications to control your symptoms. these shots decrease your immune response to specific allergens over time. They do require a long-term commitment to a treatment plan. Nasal congestion can be caused by many distinctive issues, from allergic reactions to sinus problems to the common cold. when an immune system response causes the symptom, it is considered to be allergy-related. An allergist assists you to determine the cause of your nasal congestion so that you can feel better faster.